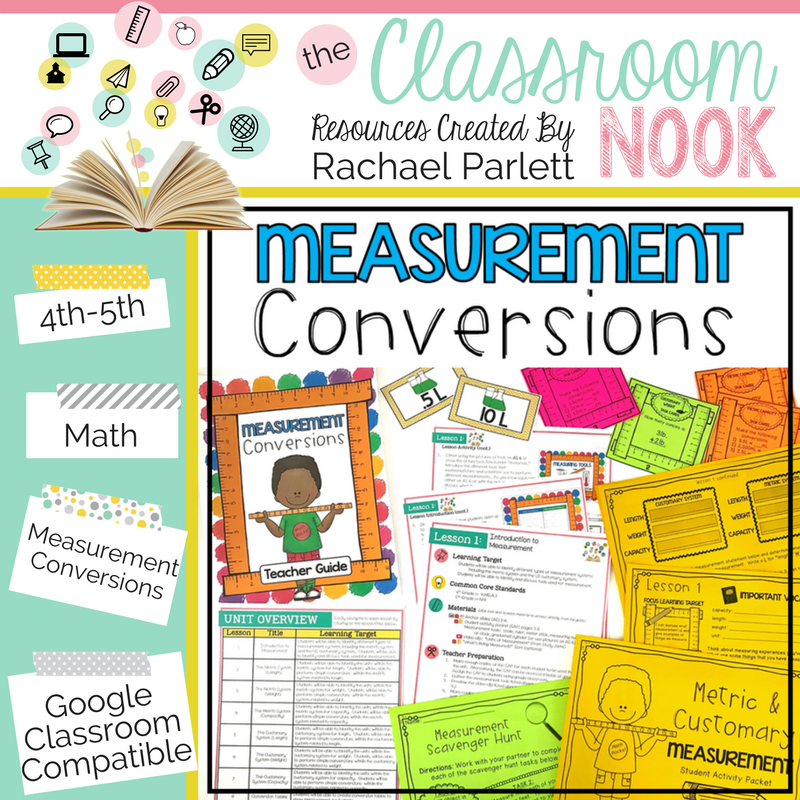 I've heard it from teacher after teacher: "I dread teaching measurement every year." It's hard to blame them. There's nothing ground-shaking about measurement. There's nothing exciting about metric vs. customary. It's just one of those skills that our students need to have in their back pocket - and so - we teach it. I'd like to challenge that, however. If there's anything a teacher is good at, it's spicing up even the most boring content. So, let's try, shall we. Have you used Study Jams before? 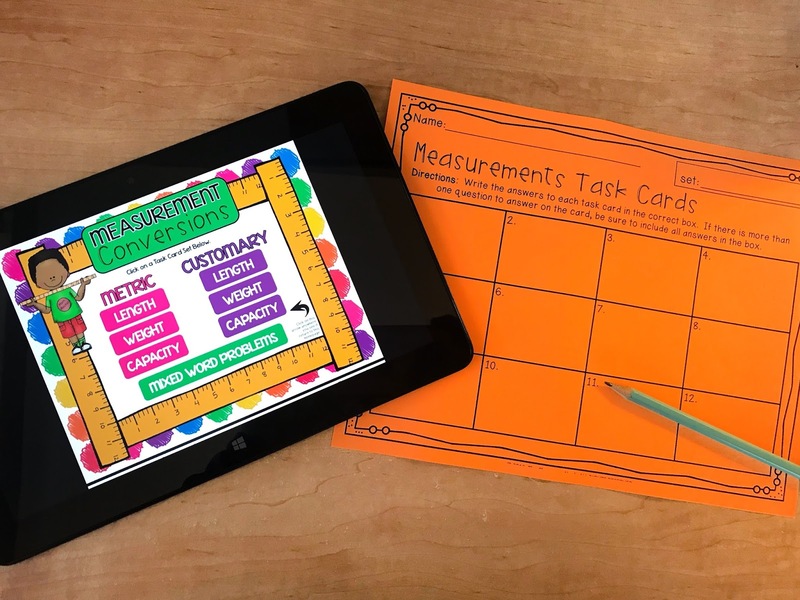 It's a free video library from Scholastic with short animated clips teaching math and science concepts - and there is a whole section devoted to measurement! When I taught measurement, I used their "units of measurement" video to introduce the difference between the customary and metric systems. You'll also find videos covering topics like perimeter, elapsed time, measuring temperature, and more! Simply head to the math section of Study Jams and search for measurement under "See All Topics". Add one of these videos to your teaching for instant engagement! Try this simple activity with your students for FREE. Simply fill out the form below and I'll send it right to your inbox! 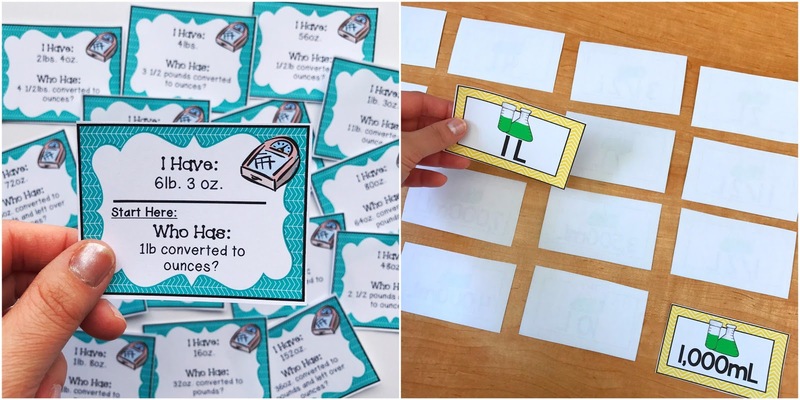 Task cards can be a teacher's favorite tool for giving students extra practice with a skill. They are so versatile. Put them at a center and have students work on them individually or use them for a whole-class game of SCOOT. Just having math problems on a task card instead of a worksheet gives students that feeling of a game - and it is much more interactive. I like to use a series of task cards for each measuring skill that students learn throughout my measurement unit. In my past blogging life I was alllll about the games on my blog The Classroom Game Nook. Give me a topic - I turn it into a game. It's what I do! :) And when you take a topic as dry as measurement, playing games is a MUST! 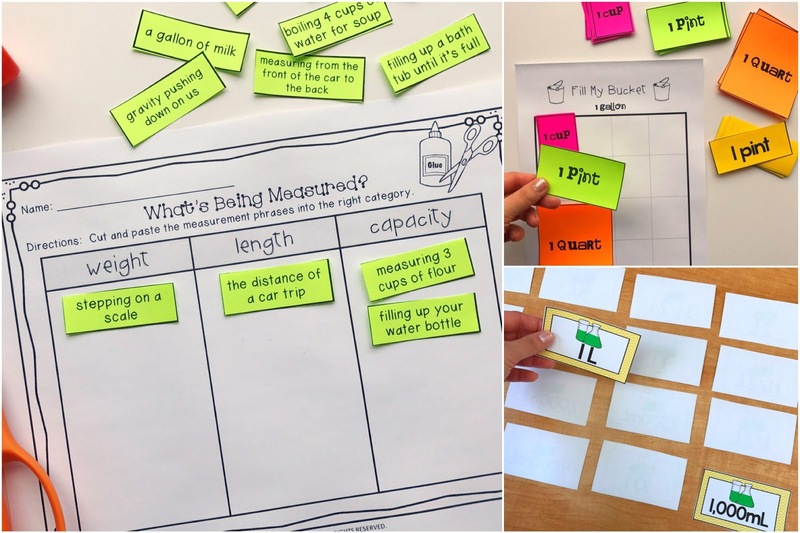 Take classic games like "I have, who has," "SCOOT", or "memory match" and turn them into games for measurement. Another game I created for my measurement unit was called "Fill the Bucket." 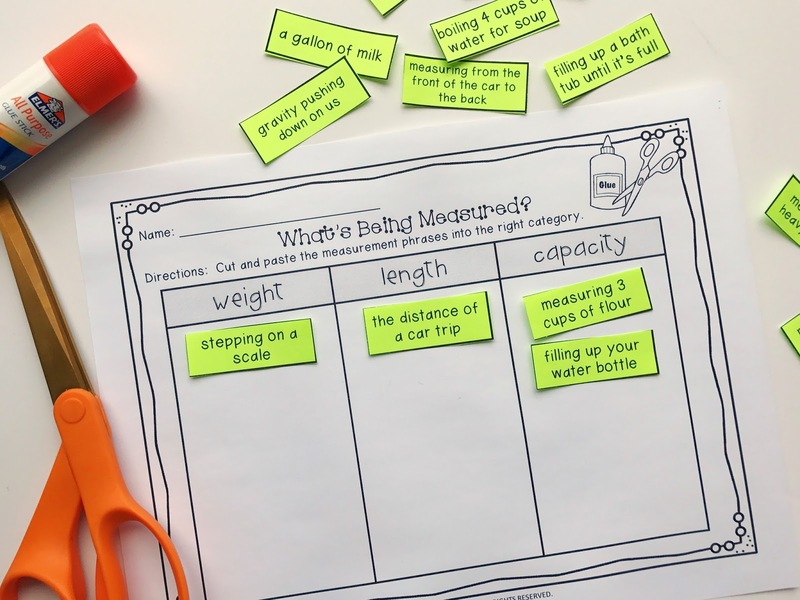 This game is played when students are learning about measuring capacity using customary units (cup, pint, quart, and gallon). The goal of the game is to be the first student to fill up their bucket. Students pick a "capacity card" from a pile indicating how much they can put in their bucket. 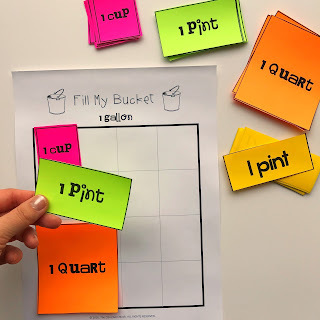 For example, if a student picks up a "1 pint" capacity card, then he/she places a "1 pint" bucket card inside their bucket. 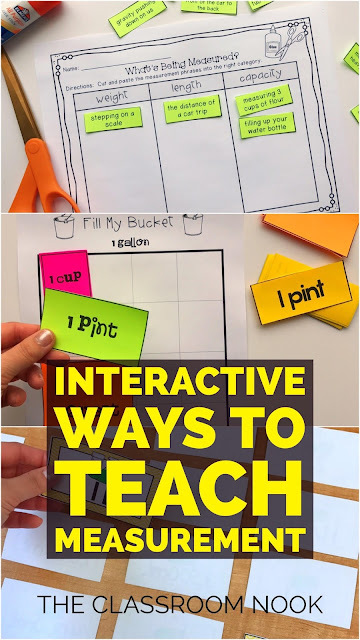 With this visual game, students can easily see that 2 cups = a pint, or 2 pints = 1 quart, and so on. 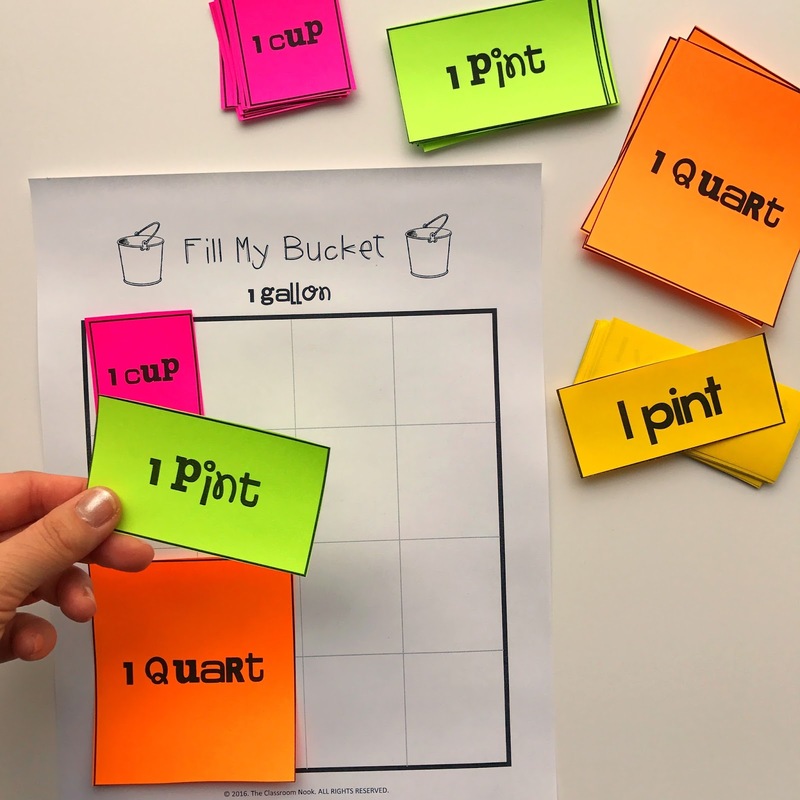 Students can even make trades (like 2 cups for 1 pint) in order to fit their bucket cards inside their bucket. There are also some trick playing cards that indicate for students to take-away from their bucket. Students have to fill up their bucket exactly without "spilling over." Students love it! Scavenger hunts are one my most favorite interactive ways to have students practice a skill - and it works PERFECTLY for measuring. 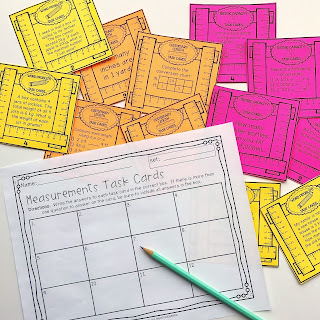 Your classroom is FULL of things to measure, so this activity takes no prep at all! Give your students a scavenger hunt sheet and a ruler and have students explore your classroom looking for objects in the classroom that fit the descriptions on their sheet. For example, on my scavenger hunt sheet, I had students looking for 2 objects that were both 2 feet long - BUT, I had them represent the actual length of the object that they found in inches. Sneaky teacher! Students would record their measurements on their sheet. PIN TO SAVE OR SHARE!